VBG6 6-way ball valves, are designed as change-over valve to connect a 2-pipe heat exchanger (Fan-coil Unit or Ceiling) to a 4-pipe system, ideally together with the Kombi-FCU Pressure Independent Control Valve used for dynamic balancing. The simultaneous rotation of two balls, mechanically connected to one stem, opens supply and return on one side (e.g. cooling) and closes at the same time the other side (heating). That avoids any mixing between the flows, and reduces potential energy losses. 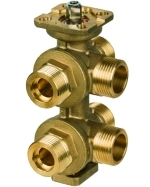 VBG6 valves are designed to be actuated by a MR6 rotary valve actuator (on/off or modulating). Position feedback on the modulating actuator can be used for remote system monitoring and system check. Additional description VBG6 valves are delivered with a flow limiter kit in the valve box. This gives flexibility in the flow rate adjustment. During installation, the used Kv value should be written on the label stripped on the valve neck.